Go birdwatching with a Birdingpal from Singapore. Singapore is a tiny country. Most places can be accessed easily. Happy to spend a morning or day birding together. I know the local birds fairly well. Singapore offers a good variety of birding opportunities, all less than an hour's travel from the city centre. 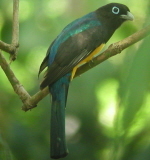 Habitats include the numerous parks and gardens, rainforest, mangrove, wetlands and grasslands. Migratory season (Aug-Apr) is particularly exciting for shorebirds, flycatchers, pittas, raptors and more. A good place to be introduced to South-east Asian birds. Local birdwatcher and freelance bird guide with more than 20 years birding experience. I am a female birder who has birded the region. I love aves and have worked with them for 7 years and have a diploma in ornithology. I am a Native of Singapore. A city state nickname "Garden City" Beautiful city with landscape that captivate and attract many migratory birds during certain seasons. I have been birding in Singapore for 10 years. Singapore has more than 300 species in a small area. I can help share this with you.